NEW ORLEANS IS THE SIZE OF CLEVELAND BUT OFTEN GETS MENTIONED IN THE SAME BREATH AS NEW YORK AND SAN FRANCISCO. Why? Because New Orleans is its own universe that revolves around music, food, art, and good people. Exploring it can be like planet hopping – there’s no limit to the variety of experiences and people you’ll come across. The Quisby puts you in the center of it. 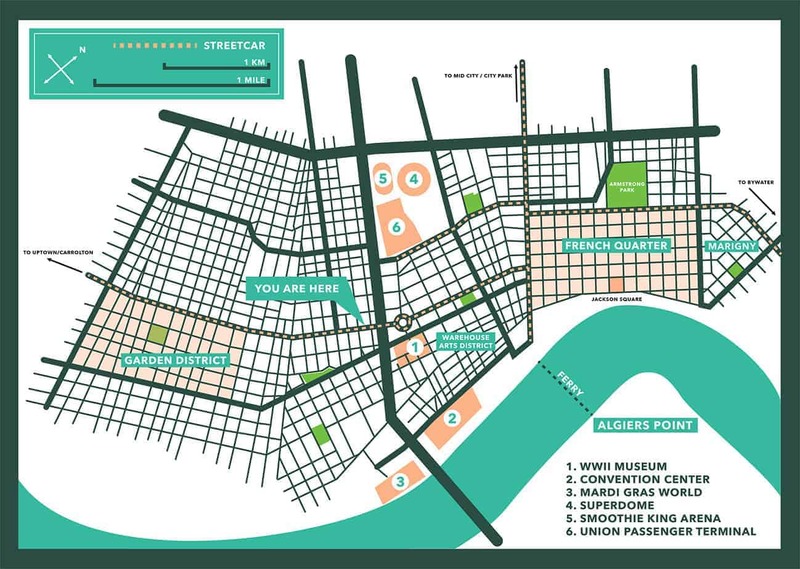 We’re located on St. Charles Ave within walking distance of the raucous French Quarter and Bourbon Street, fashionable Warehouse District, and picturesque Magazine Street and Lower Garden District. The Streetcar stops a few steps from our door and will take you Downtown to the French Quarter in under 10 minutes or Uptown past the stately mansions of St. Charles Ave, through glorious Audubon Park and gorgeous Tulane and Loyola Universities, and on to the always-lively Riverbend up Carrolton Ave.